I’ve been working on a new plugin for the past week or two, writing documentation for it, and testing it quite extensively. It finally got accepted on CodeCanyon, a marketplace for premium plugins and code. 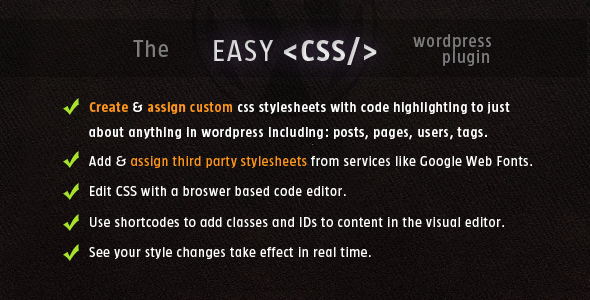 My plugin is called Easy Custom CSS Stylesheets, and it allows you to create unlimited stylesheets which are stored in the database and link them to your site, or attach them to specific pages, posts, or special pages (Category page, home page, login page, etc). This eliminates the need of modifying your theme source which breaks the ability to update the theme and is generally a hassle. You can purchase it for $14 over at CodeCanyon. 1 – newsletters (already in the Primary Widget area). 2 – Member directory (to be added). a – Who sets up the password, me or the member? b – same password for all paid-up member or unique password for each member (we have 2,500 members)? c – should password be changed each dues cycle (year)?